At first, the girl didn’t understand the pleasure of her plainness. shielded in the space left by her lack of loveliness. I didn’t want her mirror. the heart, the lung, the liver. between the lead and glass. Veronica Golos is the author of Vocabulary of Silence (Red Hen Press, 2011), which just won the New Mexico Book Award (2011). In 2004, Golos won the 16th annual Nicholas Roerich Poetry Prize (Story Line Press) for her book, A Bell Buried Deep (to be re-issued by Red Hen Press). Ms Golos is the editor for 3:a taos press, and Literary Consultant for Heather Mitchell of Gelfman-Schneider Literary Agents, Inc., New York City. Ms. Golos has been an award-winning curator and teacher for Poets & Writers, Poet’s House and 92nd St Y/Makor in New York City. Her work has been published and anthologized nationally and internationally, and adapted for theatrical productions in New York City’s Theatre Row, and the Claremont Theological Seminary in California. Her poetry was the centerpiece of My Land is Me, a four-artist multimedia exhibit in Taos, NM that questioned the western view of the Veil. 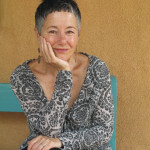 She lives in Taos, New Mexico, with her husband, writer David Pérez. This entry was posted on Monday, December 19th, 2011 at 10:59 am	and is filed under Poetry. You can follow any responses to this entry through the RSS 2.0 feed.